Images taken from medieval documents give us an idea of the main occupations of the Jewish inhabitants of Girona. Craftsmanship, commerce and money-lending were the most important among them. In addition, the literacy imposed on the boys by the Jewish religion gave rise to an outstanding scientific specialization, with well-known doctors, cartographers or astronomers. 1373, Majorca. Reproduction (original held in the French National Library, Paris). One of the most important activities the Catalan Jews engaged in was the study of science, especially astronomy and cartography. In 1373 two Majorcan Jews, Cresques Abraham and his son Jehuda, were commissioned by the king to make a "map of the known world." The result was this fine specimen with seven tables, which was given to the Dauphin of France as a wedding gift from the Catalan monarch. 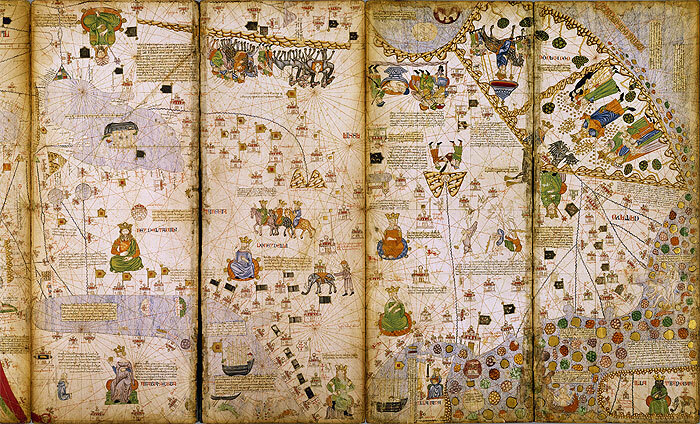 Early 15th century, Catalonia (facsimile of the original in the British Library, London). The Catalan Jews were excellent craftsmen, copiers and booksellers. The Haggadah tells the story of the Exodus and the freeing of the Jewish People from slavery in Egypt, and has been read since time immemorial on the night of Passover. Some magnificently illustrated examples are still preserved in Europe, originating from the workshops of the Jewish artists of medieval Catalonia. 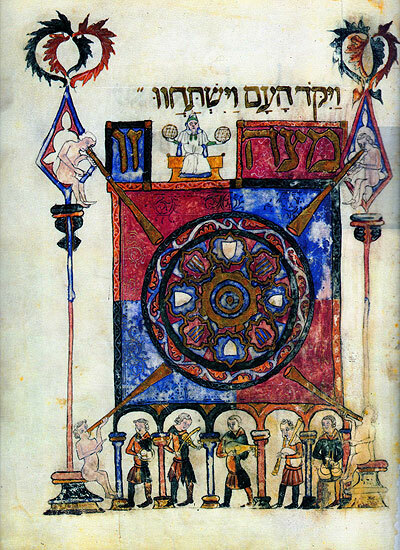 This volume is called the "Barcelona Haggadah" because it is thought that it was produced in that city.